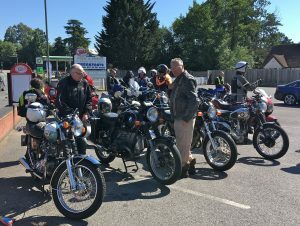 Fifteen bikes of varying vintage carrying seventeen motorcyclists, also of varying vintage, met up at Jack’s Cafe in Bagshot to participate in this years Little Switzerland Run, ably led by John Gentleman. 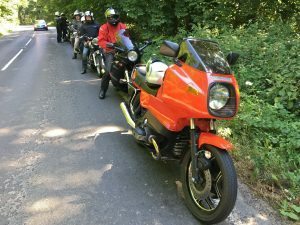 He led us on a marvellous route criss-crossing the Surrey Hills with glorious country views, cool shady lanes and a few alarming steep stony tracks. 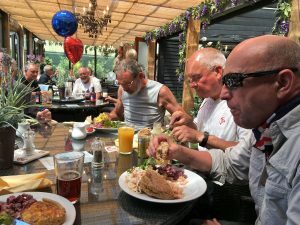 Our destination was The Chocolate Frog Tearooms at Oakhanger which was a cool haven after an excellent but rather hot ride. A good lunch and much banter followed and one unresolved question – where exactly is Little Switzerland? The origins seem lost in the mists of time unless anyone out there knows?